Just imagine the pizzazz a great-looking business card, calendar, poster, brochure or mailer can add to your business. A free Web tool from Brother, manufacturers of printers and related business products, is the perfect way to help you create attention-grabbing, eye-popping, mind-blowing marketing materials for your company with just a few clicks of the mouse and print them up on your printer! Do we sound excited? We ARE! Visit the free Brother CreativeCenter web-based design portal. Create your best brochure, mailer, poster, calendar or business card. Submit your entry to the Brother CreativeCenter “Back to Business” Contest on BizSugar.com. 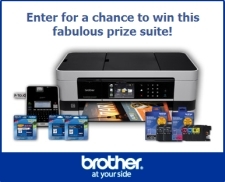 Three winners will win a Brother prize suite – approximate value of $500. Each prize package includes a cool color inkjet all-in-one printer, plus a label maker (great for envelopes and mailers! ), plus supplies. Who: U.S. residents over 18 and older (sorry, no kiddies allowed). When: Now through March 4, 2013. Where: Contest official details start here. Winners will be announced in mid-March. And remember to keep watching All Submissions here. We can’t wait to see what your small business creativity can unleash. Get started NOW! ← BizSugar Video & Image Gallery: Check It Out!